Dealing with your wife can be really tricky sometimes. You have to see her every single day and there is no avoiding. If you have been rude to your wife then you probably should just tend to it as soon as possible and apologize to her. After all, she is the one who supports you in everything you do and is with you no matter what. 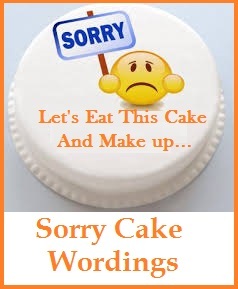 Here are a few sample sorry messages that can really help you in saying sorry to your wife. 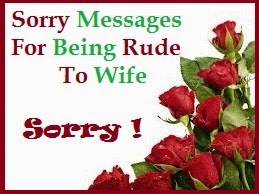 Read on to find the perfect sorry message for being rude to your wife. Hey Honey… you know I love with all my heart right? I am so sorry I was rude to you last night. It will never happen again. I am sorry! I come to apologize to you with all my heart. I know I have made you feel bad and I really want to make up for everything I did. 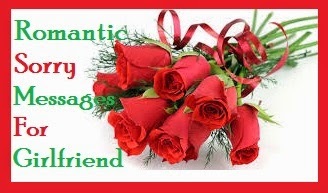 Please let me take you out for a romantic evening? I know I misbehaved with you and it made you cry. It wasn’t right of me to say those things to you. Please forgive me for it? I am really sorry. I don’t know what the hell has gotten into me. I have never been so irritable in my entire life. I am sorry I was rude to you yesterday. I did not mean anything I said to you. You have been my support system all throughout the years and the way I talked to you last night is just too shameful for me. I know I was just horrible but please try and forgive me? 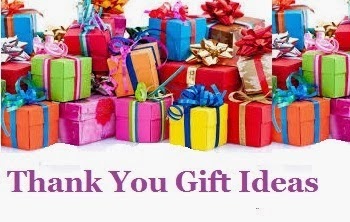 I want to take you out somewhere nice, I want to buy you something special and let you know that I love and that I will do anything to make it up for talking to you rudely. I am so sorry. You don’t deserve to be talked to you rudely and I feel I am a horrible husband for talking to you badly. Please forgive me? All this stress has made me such a horrible person. I was so rude to you last night and I want to apologize for it to you with all my heart. I love you and I am sorry. You’re so lovely, in everything you do…how you talk to me, how you behave with me, how you behave with everyone else. I wish I was like you too. I will try to be. Sorry for how I behaved. 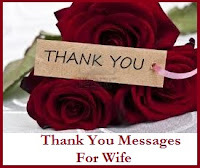 You are the best wife in this world and I wish I could say that I am the best husband in this world. I am sorry for last night. I have loved with you all my heart till now and will keep doing that. I am sorry for talking to you rudely, I never should have. I know you are kind hearted and though I was rude to you, you will still forgive me but know I am very sorry for it. I will never do it again. 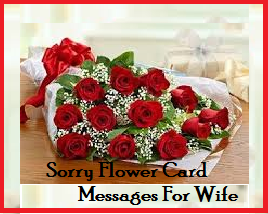 Apologize to your wife by saying a thoughtful sorry message in such a special way, that your sorry message really melts her heart. There are a lot of different ways to say sorry to your wife , so go ahead and choose the best way to ask for forgiveness. 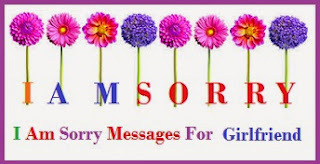 Here is an excellent collection of sample sorry messages for wife to choose from. 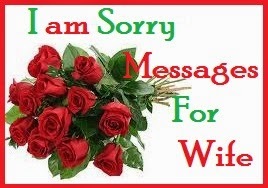 Hope these sorry messages for wife will really help you to make your wife understand that you are really sorry for hurting her. My decision to marry you was based on many of your lovely qualities and forgiveness happens to be one of them. Please forgive me dear, I am really sorry for hurting you. I really love you sweetheart! I always thought that men are physically stronger than women but the way you handled yourself when I messed up convinced me that women are much stronger. I am really sorry for my behaviour dear. I never meant to say those things and make you feel bad. I will never do it again. I am really sorry sweetheart. Please forgive me. So many tears dropped from your eyes because of me. I promise that I will do my best to keep you happy at all times. I am sorry honey. I am not saying sorry just because I should. I am saying sorry because I genuinely feel bad that I hurt you intentionally. I am sorry, please forgive me. I was heartless that I hurt you in this way. But without you, I feel like I am nothing. Please forgive me and come back dear. I feel lonely and really miserable without you. I am truly sorry sweetheart. I am not sorry that I read your conversations. I just felt jealous but I realize that I just should talked about it to you and been honest. I am really sorry baby. Do you know why I want to give you a really really really long apology. Because I am really really really sorry for what I have done. So please give me a chance to give you an explanation. Please meet me in the lunch time at our favourite restaurant. I will wait for you there at 12 :30 pm . I am sorry that I lied to you, but I am not lying to you when I say that I am really sorry about it. Please forgive me. I feel terrible about whatever happened. It is all my fault and I am sorry that I made you sad. Please forgive me , I am really sorry about it. All I ask from you is a chance to make everything better. I really want to make you happy and I want that you be with me. I am sorry dear, please come back home. I haven’t been a good husband but I promise that I will make it up to you. Please forgive me honey. 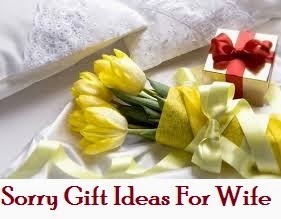 Saying sorry to your wife may take more than just a few words and some nifty gifts to woo her back. 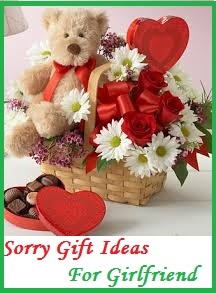 Emotional hurt cuts deeper, so be ready to sincerely apologize to her. Your bed space is in danger. Check out this list of sorry messages and sorry note for your wife to get some ideas as you formulate your own. 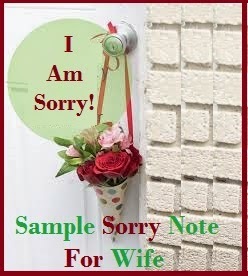 Read on to find the perfect sorry note for her. I am truly sorry my dear loving wife. I know I have hurt you deep inside. I promise it will never happen again. I know better now. Please forgive me. Sorry may not be enough for what I have done. But it is a start. I am sorry I broke my promise. Forgive me and I will change for the better. What I have done is entirely my fault. I’m sorry I caused you much pain. I am truly sorry. Please forgive me. I know telling you I’m sorry is the right thing to do. And I truly am. Forgive me please. I’ll make it up to you. I have wronged you and I am very sorry about it. You did not deserve that and it’s entirely me to blame. Forgive me please. A lie is a lie, and I have no excuses doing that to you. I am sorry. It will not happen again. I hope you find it in your heart to forgive me. I have been a fool, and I’m sorry about it. I regret it all. I hope you forgive me. It was all my fault, my dear. I am very sorry. Please give me another chance. Your silent treatment is killing me. I know I deserve it. Forgive me. I am all ears to resolve this situation. My immaturity is what caused all these. I am sorry. Please forgive me, I’m willing to talk about any solution to resolve this. I know I did you wrong. Small lies, big lies, they still are lies that hurt you so. I am sorry. Forgive me and I will change for the best. Your silence in the matter has made me think deeply. I now know it is me to be blamed. Sorry, my dear for hurting you. Please forgive me. Our troubles before were easy to overcome. Not this one. Admitting my fault is the only way. And I take all the blame. Sorry for the hurt I’ve caused you. For what it’s worth, I am so sorry. I’m willing to patch things up, for the better. I hope you will find it in your heart to forgive me. I am who I am. But if that is causing you a lot of hurt, I am willing to change. I am sorry for my stubbornness. Forgive me.